Each year, Apraxia Kids awards speech tablets to children and families in need throughout the USA and Canada. Children with apraxia can use these speech tablets for speech practice and/or as a speech-generating device. Since its inception, the Speech Tablets for Apraxia program has awarded nearly 700 tablets to children with apraxia of speech. 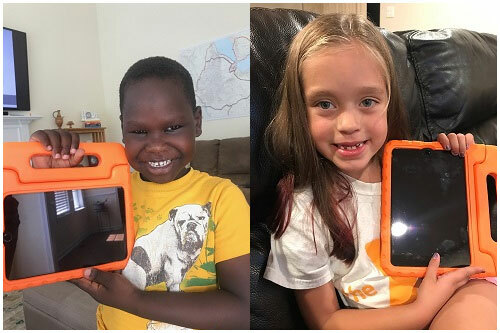 In this program, qualified children with a diagnosis of apraxia of speech are provided with speech tablets and protective cases in order to assist with speech practice; use as a communication tool and educational support. In a world of increased technology, we identified an opportunity to connect children in need with functional speech tools to help them reach their highest communication potential. Parents and speech therapists can enhance speech practice at home and across environments when using a speech tablet. Additionally, children who are still struggling to be understood can utilize augmentative and alternative communication (AAC) as a communication tool. In a research report regarding our Speech Tablets for Apraxia program (formerly known as iPads for Apraxia), parents and therapists reported positive perceptions of and experiences with the iPad technology at home and during speech therapy. Children reportedly experienced excitement, motivation, immediacy, reduced frustration, and the ability to practice speech outside of therapy. The deadline has passed for applications. Please check back in June for additional information regarding our application process. Individuals are able to email speechtablets@apraxia-kids.org for questions. No other email addresses will respond to questions. Beginning in 2018, there will be two speech tablet options available: (1) an iPad with case and (2) the Tobii-Dynavox Indi with case and the Snap + Core First app installed. Your child’s Speech-Language Pathologist will play an important role in helping us determine the best option for your child. We reserve the right to choose which tablet to award, based on all of the information provided. When a child receives a speech tablet, a world of communication opportunities are unlocked. Read some stories from previous recipients of speech tablets! Increase your understanding of how a speech tablet can be used to aid in therapy and communication with some resources from our Article Library! Our Speech Tablets for Apraxia program puts tools for improved communication directly into the hands of children with apraxia of speech. Donate today to provide the gift of speech to more children in need.